WARNING! For now vendor subscription billing only support Stripe payment method. Create subscription plans for the vendors. Vendors will see the offers on the merchants landing page and will be able to register any of these plans you created here. Set the plans very carefully. First, you have to create Stripe subscriptions. You can check out the Stripe’s documentation here for creating subscriptions. 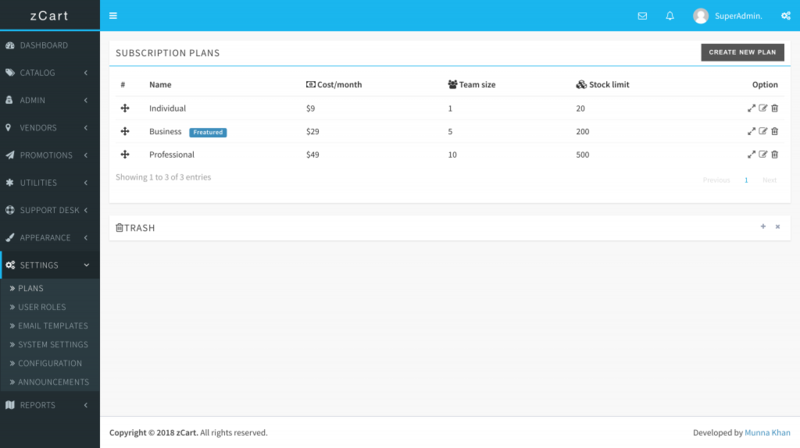 Then create the same subscription plan on you zCart admin panel. INFO: The subscription plan ids have to be exact same in both platform. TIPS: It’s recommended to create maximum 2 or 3 plans, not more than three.